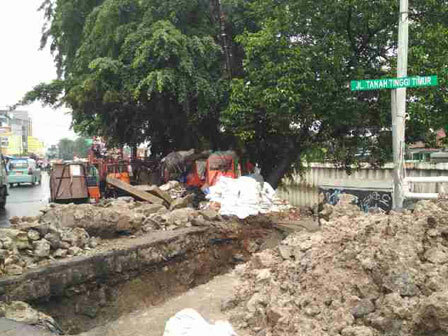 A collapsed road that is located at Jalan Tanah Tinggi Timur, Harapan Mulya Urban Village, Kemayoran, precisely Kemayoran towards Galur junction, finally repaired by Central Jakarta Water Management Sub-dept.
" Repair has been ongoing since Saturday night and will be complete four days"
Central Jakarta Water Management Sub-dept Head, Dicky Suherlan stated, reparation was done at night at 9 PM. "Repair has been ongoing since Saturday night and will be complete four days," he expressed, Monday (2/29). He added, the collapsed road is due to land subsidence. Even its crossing channel well also collapsed. "We sent 12 officers to repair," he closed.